A spotlight on outstanding young alumni, from the lab to the stage. It is often said that the true value of education only emerges over time, in the ways individuals lead and the impact they have on others. We agree. Sometimes, though, sparks of genius can be seen immediately. They can emerge in a lab or a field— pretty much anywhere. And, occasionally, those sparks ignite after graduation and lead to extraordinary accomplishments. 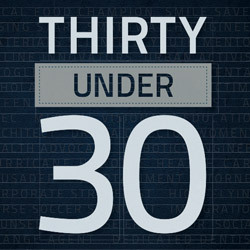 Here we highlight 30 alumni who have invented, influenced and become standouts in their fields, all before the age of 30. The list is by no means complete, but nevertheless inspires. We can’t wait to see what they’ll do next.